Home » sorbet » Homemade Sorbet Ice Cream for those Suffering from the Flu! 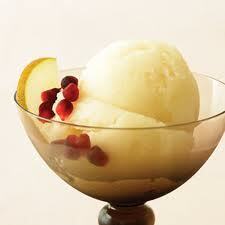 Homemade Sorbet Ice Cream for those Suffering from the Flu! My wife loves to make homemade ice cream and came across this recipe called "Influenza Rx Sorbet" by Jeni Britton Bauer in her homemade ice cream cookbook. The recipe includes lemon and orange juice for Vitamin C.
Ginger and cayenne to help clear nasal passages as well as antiseptic properties. Humectants, honey, and liquid pectin to help a dry, itchy throat retain moisture. Sorbet in and of itself helps calm an inflamed sore throat. Though I would love to regurgitate the recipe, you will have to buy her New York Times bestselling homemade ice cream cookbook. It's on page 180-181. Oh... and by the way... the other ice cream recipes are quite yummey!